Summer Cassel plunged the paddle into the water, battling Shenandoah River’s powerful current. The recreational kayak sliced across the rippling surface, forging ahead as if it were as eager as Summer to reach the wild blackberry brambles. The plump, ripe fruit would make a delicious cobbler, and she could use the dessert as a catalyst to initiate conversation with the elusive neighbor who had moved into her apartment complex three weeks ago. With only five units comprising the renovated historic hotel tucked in Virginia’s countryside, an official welcoming committee didn’t exist, so Summer had taken it upon herself to make Mr. Hawk feel at home at The Meadows, even though she had yet to properly introduce herself. Of course, that wasn’t her fault. He’d skirted around her each time they’d crossed paths as if she carried some kind of contagious disease. The only reason she knew the attractive, dark-haired man’s name was because of the engraved label her landlord had placed on Mr. Hawk’s mailbox. She was sure a fresh, warm blackberry cobbler would open the door to conversation. But first, she had to harvest the main ingredient. As she continued her steady strokes, nature invited her into its folds. Thick woodlands masked Summer from sparse homesteads located alongside the river, and blocked the view of the nearby Blue Ridge Mountains. She’d think herself alone in the wilderness, if not for the occasional group of adventure seekers passing by on inner tubes or canoes. Although the early June temperatures rose to uncomfortable levels, sycamore, river birch, and silver maple trees stretched over the winding waterway, creating ample shade—a true blessing in the midafternoon heat. Scents of ripe fruit caught on the breeze. Summer scanned the shoreline and found her target, exactly where her landlord had described: after the second bend in the river, ten feet to the left of a towering cypress tree. The brambles stretched above overgrown grass, a mass of thorny tangles overflowing with nourishing fruit. The river’s strong current and rocky terrain made maneuvering to the riverbank a concentrated effort. After avoiding numerous underwater obstacles, Summer managed to beach the kayak and secure a rope to a small tree. She climbed across exposed root systems and fallen branches, and by the time she reached the blackberries, beads of perspiration trickled down her chest and back, soaking her favorite tank top. But it didn’t matter. She was about to get her hands dirty, her arms scratched, and expose herself to ticks and various insects. A little sweat was the least of her worries. She only hoped Aiden Hawk would appreciate her efforts. Summer plucked a blackberry from the vine and sampled it. Sweet. Ripe. Perfect for her needs. Anticipation fluttered in her belly. She could taste the cobbler already. One hour and many thorn pricks later, Summer had an overflowing bucket. She returned to the kayak, secured the blackberries, and then shoved away from shore. Using the paddle to steer, she allowed the swift current to carry her toward home as she considered her plan. So, she wasn’t immune to a good-looking guy. Big deal. She was human. Regardless of his appeal, this upcoming meet and greet was strictly about making proper introductions and welcoming him to the building—same as she’d done in the past with other new tenants. He was her neighbor, after all. With his door directly across the hall from hers, they were bound to run into each other from time to time. And it would be awkward if they didn’t speak. Summer made certain the bucket of berries remained steady, and then aimed the kayak toward the river’s center as she neared a set of Class II rapids. The fun stretch had her bobbing along for a few minutes until she reached calm waters again. As snatches of The Meadows came into view, Summer marveled at how well her landlord, Frank Hamilton, had transformed the 1930s hotel into a sleek and modern apartment complex. From the outside, the two-story stone and wood structure looked like a charming cottage complete with a well-maintained wraparound porch. But it was the inside that had solidified Summer’s decision to sign the lease and move in last year. She loved the apartment’s open floor plan, the French doors leading to a private balcony overlooking the river, and the living room’s wood-beamed cathedral ceilings. The place felt like home the moment she’d stepped in the door. The air conditioning worked great, too. Which reminded her…she was hot, thirsty, her scratches stung, and the perspiration she hadn’t minded a while ago had begun to make her skin itch. She swiped aside a rolling sweat bead and paddled toward shore. It would’ve been nice if along with all the reconstruction, Frank could’ve put in a boat ramp beside the dock. When she’d suggested it, he had informed her it was a choice between having hot water heaters in the apartments or a ramp. She liked having hot water. He’d made the right decision. So, here she was with a nine-foot kayak and a steep shoreline over which she had to haul it. She’d done so before, many times, but each time, she was sure she would pull a muscle. Oh well, steep bank or not, she would accomplish her mission. The kayak bumped against the shore, and Summer stepped into the cool water. Carefully, she set the bucket of blackberries on land first, then grabbed the kayak and tugged it toward the crest of the hill where the beach met the grass. The boat slid several inches and teetered on the edge. One more pull should suffice. Familiar rumblings of a truck pulling into the parking lot at The Meadows broke her concentration. Aiden Hawk drove a black, full-sized, double-cab pick-up, and the powerful engine liked to make an announcement each time it arrived. Summer pictured herself from Mr. Hawk’s point of view. She must look a sight with her hair in disarray, her arms stretched to their limits, and her damp clothes plastered to her body. Maybe he would continue inside without giving her a second look, or even a first one. She spared a glance over her shoulder. No such luck. His blue-eyed gaze was trained on her. He took a step toward her, concern marring his brow. Her stomach sank. If he got too close now, she’d scare him away for certain. She needed to get cleaned up before he came within a ten-foot radius. With renewed determination, Summer put every ounce of strength into one last yank. The boat gave way, plopping onto the grass as she fell backward. Mr. Hawk stilled, waiting as if unsure what to do. Summer gave a thumbs-up, hoping he’d do what he always did—disappear into The Meadows and make a beeline for his apartment. If he’d only waited a few more minutes to come home, she could’ve introduced herself properly. Oh well. Nothing she could do about that now. His concerned expression eased, and he ducked his head and busied himself with something inside his vehicle. Summer relaxed. His touch of concern was nice, but she really would’ve been embarrassed to have him come too close. Dottie Carlson emerged from the apartment complex with Patches, her beloved Chihuahua, tucked in her arms. 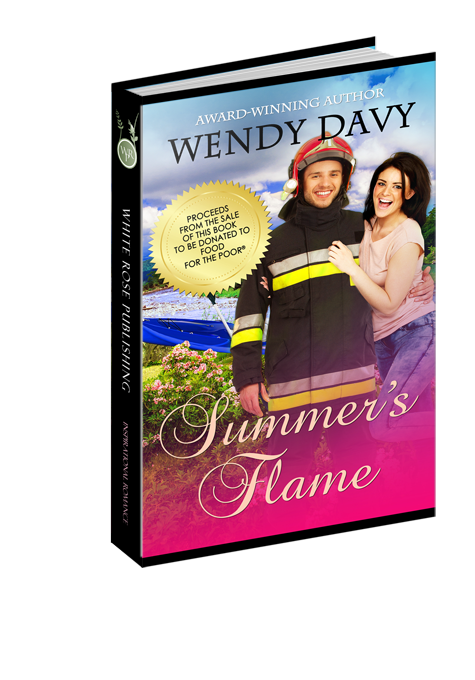 She waved at Aiden Hawk and shuffled toward Summer, her white hair bouncing in the breeze. As Dottie crossed the well-manicured lawn, Patches grew anxious and wiggled out of her arms. He landed with legs already pumping, gaze zeroed in on Summer. Like a slingshot, he surged forward, leaving tufts of grass flying in his wake. Should’ve known better than to give him bits of her steak dinner the last time she’d watched him for Dottie. Now, Patches was forever her best friend, with all the rewards. Summer braced herself, but one could only do so much in preparation for dog kisses. With less than a yard to spare, Patches leapt into the air and landed on her chest. The eight-pound, rock-solid canine knocked her backward. This was no ordinary Chihuahua. Eager to please and full of affection, Patches licked Summer’s face. “Patches. Mind your manners,” Dottie admonished, but a smile adorned her wrinkled features. “It’s OK.” Summer wrapped her arms around him and accepted the greeting. In the condition she was in, what harm could a little dog spittle do? She laughed as Patches continued to welcome her home as if she’d been gone for weeks. “You’ve been feeding him people food again, haven’t you?” Dottie’s hands found her ample hips. Summer eased Patches from her lap and stood. She attempted to brush the fur off her tank top, but errant strands stuck to the damp material and added to her already unkempt appearance. Self-conscious, Summer allowed her gaze to stray toward the parking lot. Aiden Hawk stood alongside his truck, looking her way. His features relaxed with a grin. He straightened, tucked hands into pockets, and then turned and hurried into the building. But not before she caught sight of the pink staining his cheeks. Or had she imagined his reaction? A strong, virile man like that wouldn’t blush. She must be seeing things. “Oh, he will like that. He has a sweet tooth. Not that you could tell by looking at him.” Dottie kept an eye on Patches and when he got too close to the water, called the dog back. Question 1: When Summer is overwhelmed by taking on full responsibility for Zack, Aiden steps in to help. When was the last opportunity you had to help someone in need? Question 2: Aiden shows patience when it comes to giving Summer space and time to make her decision about their relationship. Do you think their relationship would have turned out differently if he had pushed her into an answer before she was ready? Question 3: In the beginning of the novel Aiden was shy around Summer to the point of avoiding her. What do you avoid out of fear? Question 4: Summer tries to protect herself from being hurt but realizes her fears are keeping her from God's plan for her life. Do you allow fears to lead your decisions? If so, what could you be missing out on by allowing fears to overcome faith? Question 5: Patches, Zoe and Tom Cat keep things interesting around The Meadows and provide much needed comic relief when emotions run high. Do you allow yourself to enjoy life no matter the circumstances?